Completed missions - Welttierschutzgesellschaft e.V. The persistently bad economic situation of the country is forcing many Argentines to earn their living as "Cartoneros" by collecting recyclable garbage. Workhorses are often used as support, because other means of transport are simply too expensive for them. The "cartoneros" often lack knowledge about animal friendly husbandry of the horses. That is why the animals suffer in many places while a lack of reachable veterinarians complicates the situation. 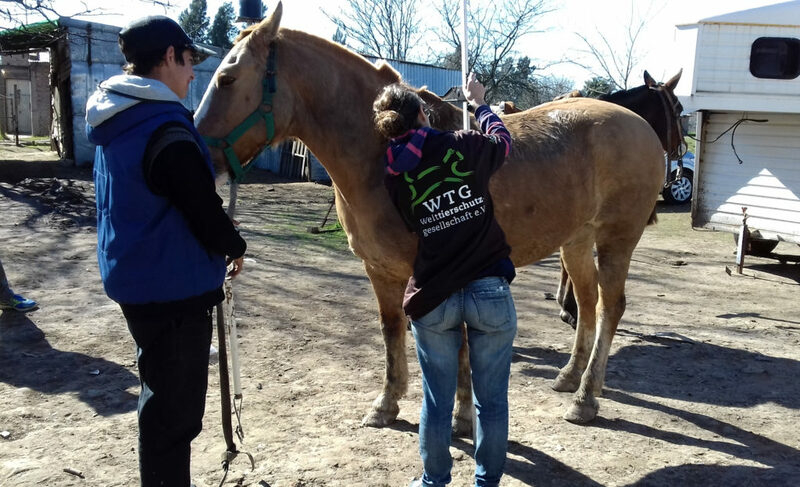 In early 2017, the Welttierschutzgesellschaft, in collaboration with the local organization Fundación Argentina de Bienestar Animal (FABA), launched an education and care project to improve the well-being of Argentine workhorses. A senior veterinarian and expert in equine health visited five rural communities around the capital, Buenos Aires, with veterinary students from the University of Buenos Aires. Nearly 400 horses were examined and properly cared for. In order to keep the animals healthy in the long term, the organisation also talked to the owners about the basic needs of the animals and gave them tips on how to contribute to improved animal health. In addition, each animal was screened for infectious anemia, a locally prevalent disease, using a blood test. Farm animals in Argentina must be registered with the Food Quality and Safety Authority (SENASA) to prevent the disease from spreading rapidly in the event of an outbreak. In September 2017, the Authority decided to impose fines on veterinarians taking blood from unregistered animals and laboratories testing unregistered animals. Since most of the horses used by the "Cartoneros" are not registered, this service could not be offered in the mobile clinics. A meeting with representatives of the authorities brought no change. As a consequence, fewer and fewer horses were brought in the course of time. At the same time, the internal structures of our partner organization have changed. As a result, the local team was reduced so that the project could not be continued by FABA. 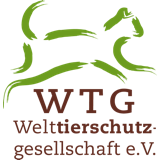 The cat house was launched in October 2014 and marked the beginning of cooperation between the Welttierschutzgesellschaft and the Streunerhilfe Bulgarien. The idea was to give temporary protection to old, sick and weakened cats and to release them, as soon as their condition allowed it, to their usual places. Initially housed in a rented apartment in Plovdiv, the cat house was relocated to a site outside of the city in early 2016, where the cats have access to both a scratching post, sleeping and play facilities, and an adjacent secured outdoor area. Because of the numerous animals, which could not be released into the streets, due to their age or health condition, the cat house functioned as a foster home for cats, which - mediated by our partner - looked for a new, long-term home. In addition, due to many animals, for which it was difficult to find a home, such as cats with disabilities or chronic diseases, hardly any animals, other than in the original idea, could be temporarily rehomed. Therefore, we have left the management of the cat house in the hands of a local animal welfare association, whose employees take care of the animals. With the first castration clinic, which was founded in June 2016, we are now focusing on this measure as the key aspect of our commitment to the cats in Plovdiv. Our goal is to castrate the cat population and thus sustainably prevent new animal suffering. From 2013 to 2016, the Welttierschutzgesellschaft supported the Angkor Center for Conservation of Biodiversity (ACCB) in providing medical care to those in need, such as leopard cats, silvery langurs and slow loris, and reintroducing them wherever possible in their natural habitat. As part of our cooperation, extensive modernization work was carried out at the quarantine station. These were urgently needed to create the best possible conditions for a successful rehabilitation and reintroduction of the animals. Another focus of our cooperation was on promoting education to strengthen the sustainable protection of animals in the country. Since wildlife is often kept as a domestic animal in Cambodia, it is fundamental to educate local people on endangered species. The ultimate responsibility for the protection of the animals of a country lies with the population itself. In the framework of the "Eco-Club" elementary schoolchildren from four communities adjacent to the ACCB were given a playful presentation of environmental and animal protection topics. There were also information sessions for community members of all ages in a total of 15 villages, with presentations and films showing educational content. In addition, the Welttierschutzgesellschaft also promoted further training activities for rangers and employees of authorities. 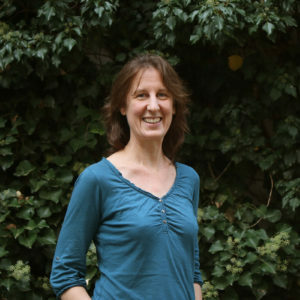 This was important because a lack of expertise regarding the needs of wildlife often complicates the implementation of existing protection laws. As a result of the measures mentioned above, we have not only been able to provide veterinary care to numerous animals and give them back their freedom in nature, but also impart urgently needed knowledge that will have a long-term positive effect on the animals' living conditions. The Island State of Sri Lanka is on the rise in many ways: Since the end of the civil war, growing exports have been boosting the economy and living standards of Sri Lankan's 21 million people. Although humans have a good relationship with their animals, many domestic animals and livestock unnecessarily suffer because there is inadequate veterinary care in the country. There is no training as a veterinary assistant and a lack of qualified veterinarians. VETS UNITED was able to successfully train veterinarians in two course units. Our project in Malawi has started a new phase. In addition to the vaccination and castration clinics that we have been supporting since 2013, we started a mobile training clinic for veterinary students in December 2016. In this way, we combine the urgently needed assistance in the villages and communities with our training program VETS UNITED and improve veterinary care in Malawi in the long term by continuing our training locally. As part of two projects with the organization Vets for Change we give hope to the strays of South Africa. In the provinces of KwaZulu-Natal, Eastern Cape, Limpopo and Mpumalanga, which border on the neighboring state of Mozambique, the rabies virus is widespread. In the past, the local authorities responded to rabies outbreaks again and again with pointless dog killing. Large-scale vaccination campaigns prevent the outbreak of an uncontrollable rabies wave and eliminate the virus in the long term. Through our commitment, we also showed that there are alternative and more animal friendly solutions to the rabies problem. Several times a year, preventive vaccination campaigns and education measures were carried out. In 2014, more than 18,000 dogs were vaccinated against rabies as part of two large vaccination campaigns in the states of Limpopo and Mpumalanga. By mid-2015, another 13,000 dogs could be helped. At the same time, vital treatments such as those of underfed stray dogs or weakened puppies were not forgotten. They received vitamins and the necessary care. The population in the provinces now warmly welcomes the Vets for Change team and their advice on how to deal with the animals. Each vaccination provides an opportunity to talk to the dog owners and provides an opportunity to banish the ignorance about rabies. The organization is still working in the provinces. From August 2013 to November 2014, the Welttierschutzgesellschaft and the Dutch association SDB (Stichting Dierenopvang Bosnie) have stood up for the stray dogs in Bosnia. The aim was to stem the uncontrolled reproduction of dogs and to alleviate animal suffering through medical care. With our help, a large castration campaign was carried out in the Bosnian town of Zenica. There are an estimated 2,500 stray dogs. Due to this large number of dogs, there was a constant battle for food and territories, which meant that many animals were heavily emaciated and injured. Young animals often die from cold and other extreme weather conditions. In addition, because of the lack of primary care, infectious diseases and parasites such as worms or fleas spread very quickly, causing additional stress for the animals. Within the framework of the castration campaign we supported, a total of 313 dogs and 18 cats were spayed and medically treated. All animals caught had to undergo a general examination, were castrated, vaccinated and treated for parasites. After the animals had recovered from the operation, they were tagged and released again in the area where they were captured. In addition, we were able to provide three aid missions in the summer of 2014 after the catastrophic Balkan flood. As part of the aid missions, more than 25,000 kg of feed rations and other aids were shared in the affected, northeastern regions of Bosnia. The castration campaign we supported contributed significantly to the achievement of the overall goal of 1700 castrated dogs. This means that currently 70% of all strays are castrated and thus the stray population has been efficiently reduced. The project will now be continued at local level by continuing regular castration campaigns, medical check-ups and laying out food rations. From autumn 2012 to the end of 2013, the Welttierschutzgesellschaft, together with the association Chance für Vier Pfoten, have stood up for the stray cats on the Greek island of Lesbos. The goal of the castration program was to stem the uncontrolled reproduction of cats. The place of action were the villages of Skala, Eresos and Sigrid, where there are an estimated 1,250 street cats. Due to this large number of cats, there was a constant battle for food and territories, which meant that many animals were strongly emaciated and injured. In addition, because of the lack of primary care, infectious diseases and parasites such as worms or fleas spread very quickly, which led to additional stress for the cats. In the three castration campaigns, a total of 599 cats and 25 dogs were castrated and medically treated. Over 90% of castrated cats were wild cats caught with cat traps. All animals caught had to undergo a general examination and were if possible castrated and treated for parasites. After the cats had recovered from the operation, they were returned to the area where they were captured and released. The condition of the stray cats has improved significantly as a result of the missions and the project is now being continued independently at the local level by feeding and controlling the animals on a regular basis. In India, in 2013, one human died each hour as a consequences of the rabies virus. More than half of them were children. The transmission of the virus was mainly by bites from stray dogs. In September 2013, with the support of the Welttierschutzgesellschaft, the unique mission "Mission Rabies" for India started. The aim of the large vaccination campaign of our partner organization Worldwide Veterinary Service was to reduce the rabies rate and stray population in a humane and long-term way. Within nine months, more than 9,500 dogs were castrated by 500 volunteers from 14 countries, more than 90,000 dogs were vaccinated against rabies, and more than 75,000 children were educated about rabies through school visits - a big step on the road to a rabies-free future! Through the approach “help to help themselves”, the project is now so successfully established in the country that it can be independently managed and expanded! Together with the Costa Rican organization Pretoma, we supported the "Costa Rica Needs Sharks Alive" campaign from the beginning of 2013 until the end of 2014. The aim was to protect the sharks both from the coasts and in the oceans of Costa Rica from the consequences of overfishing and the shark fin trade to achieve a long-term change in the handling of the animals. The focus of the campaign was on the dialogue with the relevant national and international policy, education and sensitization of the indigenous population on the topic of finning and shark slaughter as well as the optimization of fisheries management. The campaign was successful on the political, industrial and social levels. Together with the government, a guideline for a better control of the finning trade as well as a demand for the inclusion of the silk shark in the Appendix II of the CITES was developed. This was supported by a petition. In addition, 18 renowned fish restaurants were won over as members of the "Live Sharks Coalition". The restaurants committed to never offering shark products on their menu. In addition, 49 Costa Rican celebrities were mobilized for the media support and distribution of the campaign. Through the measures mentioned above and other various publicity campaigns, a change in consciousness has been observed in the broad society as well as among local fishermen. In exceptional situations, such as natural disasters or acute animal threats, we provide immediate aid. In Autumn 2018, exceptionally heavy rain and several cyclones endangered the life of people and their pets in the Indian state of Odisha. Whole villages were destroyed, grazing land flooded and there was the threat of several contagious diseases spreading. Veterinary help was urgently needed, however, vets and qualified veterinary personnel are rarely available in rural areas of Odisha. With our help, the local animal welfare organization Action for Protection of Wild Animals (APOWA) was able to dispatch a team of five. For three months, a vet, two veterinary care assistants as well as two animal care assistants travelled to 24 villages and treated up to 350 animals daily. More than 12.000 cattle, goats, sheep, but also dogs and cats, were treated in the coastal districts Kendrapara and Ganjam (Odisha). Due to the teams hard work the original target goal of 8.000 animals was exceeded by a large margin. The animals received the basic essentials, such as food, clean water and vitamin supplements, in addition to vaccinations and, when necessary, veterinary treatment of their wounds. 900 animal owners were given food supplements and minerals for their animals and were given key information on their animals’ feeding routine. Likewise, 94 animal owners were taught how to re-build their destroyed stables properly and hygiene-appropriate by the emergency-team. Additionally, 12 villages were given an emergency first aid kit, containing disinfectant spray, sterile bandages and other equipment for primary care of small wounds – an approach that has been successful in our other Project "Livestock in India”. After the destructive floods in Tanzania, animals and humans can now finally. Together with our partners from the Tanzania Animal Welfare Society (TAWESO), which focuses primarily on Dar es Salaam on animal markets and the coastal regions of the country and with the Tanzania Animals Protection Organization (TAPO), the only animal protection organization in the rural Shinyanga region in the west of Tanzania we provided emergency aid from April to June 2018. In the coastal region around Dar es Salaam, 28,100 kilograms of concentrated food and minerals were given. Here the heavy rain had flooded the fields and completely destroyed the crops. The animals, weakened by the recent drought, found no food and were extremely hungry. Over a period of 39 working days, we were able to provide 6867 animals such as donkeys, cattle and sheep with much-needed feed and vitamins, which strengthen the animals' immune system and prevent diseases. Extremely weakened and ill animals were also treated by veterinary medicine. In western Tanzania, where TAPO is based, we have been able to help more than 1,500 animals in 10 communities from late March to early June. They were hit hardest by the effects of the extreme weather conditions. As the pastures were completely flooded, we mainly gave out food and the animals were provided with minerals and vitamins in order to strengthen the immune system of the animals. Our emergency aid was a success thanks to the loyal supporters we could count on in this great distress - many thanks. In November 2017, Tanzania was in a state of emergency. For a year, almost no raindrop fell. Together with three local partner organizations, we helped numerous livestock and their owners in this extreme drought. In the northwest of Tanzania, we, together with the Tanzania Animals Protection Organization (TAPO), were able to take care of animals in 24 villages over a four-month period. Water, multivitamin concentrates, minerals and a special feed mix for livestock were given out at the central feeding stations of the communities. If the employees met animal keepers on their journeys, they were also provided with food and water for their animals. In addition, small farmers who live far away from the villages were approached and supplied directly. With a total of 540 kg of feed, 7,000 liters of fresh water, 250 bottles of multivitamin concentrate and 400 kg of minerals, more than 4,000 animals were temporarily treated in this emergency situation. All livestock owners were also registered with the number and type of animals as part of this emergency aid. In the regions of Kongwa and Mpwapwa in central Tanzania, our help, which we provided together with the Tanzania Animal Welfare Society (TAWESO), focused on the big livestock markets, where we could help more than 2,300 animals. We are also working with our local partners on long-term supporting measures for the devastating effects of upcoming droughts, such as improved rainwater collection, conservation of grass, and the establishment of more robust forage crops. Our partner organization Meru Animal Welfare Organization (MAWO) has already met with representatives from 16 districts from the fields of agriculture, environment, livestock husbandry and community development during a two-day workshop. 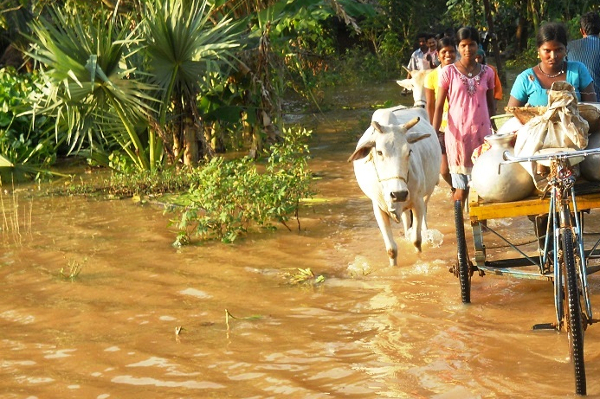 In September and October 2017, we, together with our partner organization Action for Protection of Wild Animals (APOWA), were deployed in the Indian region of Odisha, which was hit particularly hard by the flood, with immediate aid. 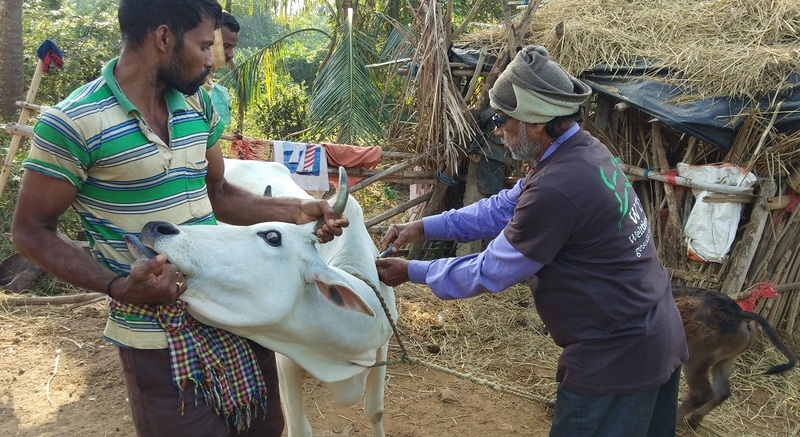 In addition, a team consisting of a veterinarian and four helpers traveled through several communities in the regions of Pattamundai and Kendrapara and helped where it was most needed. The balance of the emergency aid is pleasing: Within just two months, 7406 animals in 32 villages were provided with medical care, with vital vitamins and minerals and were vaccinated. Infected wounds, diarrhea, fever and pneumonia were treated. Each village has also been given a first-aid kit that allows residents to take care of little wounds themselves. It contains disinfectant spray, sterile bandages and other first aid equipment and has been handed over to a trained community member. In addition, 781 pet owners were reached, who were informed about an animal-friendly supply even in these emergencies. 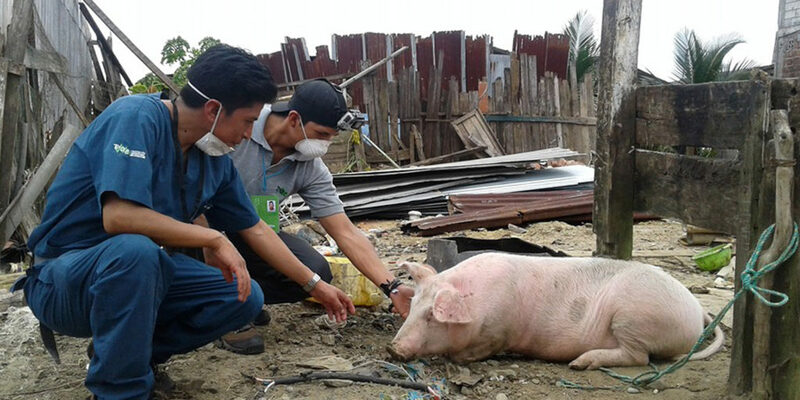 After the devastating earthquake in April 2016, the Welttierschutzgesellschaft supported the local organization Protección Animal Ecuador (PAE) in taking care of domestic animals and livestock. In addition, a catalog of measures was created for the sustainable protection of animals in the volcanic areas. Employees of our Malawian partner organization LSPCA (Lilongwe Society for the Protection and Care of Animals) reported dramatic scenes in January 2015: Houses were washed away and countless domestic and farm animals died in the floods. They were talking about more than 250,000 injured animals, including goats, chickens and pigs, but also dogs and cats. Surviving animals were left behind or could no longer be cared for by their owners since no funds were available for this. 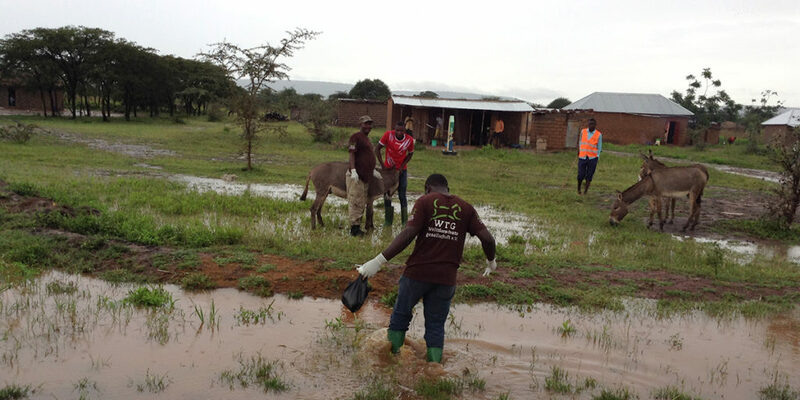 Together with our partner organization LSPCA and in co-operation with the Ministry of Agriculture and Food Security, we have been particularly active in the areas of Balaka, Zomba and Inga (in eastern Malawi), which were hit hardest by the floods. 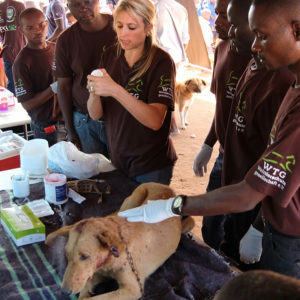 Pets and livestock, which are often a livelihood for the Malawian, were given veterinary care and were vaccinated as a precaution. A total of 2172 cattle, 37963 goats, 34513 chickens, 1453 sheep and 1871 pigs were treated. The mission has secured the survival of the animals and the livelihood of the people. We continue to work in Malawi to ensure animal welfare in the long term.